With springtime finally arrived it's been nice to enjoy some continental style weather. For some reason, the month of May always puts me in mind of Paris. So in addition to looking up flights and places to stay it is also a time to bouquiner my book shelves and imagine myself there. Last Christmas, I got a lovely book as a present. 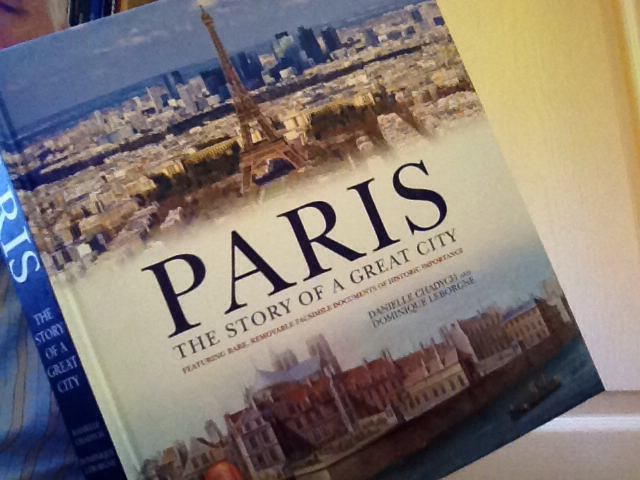 Paris, the Story of a Great City by Danielle CHADYCH and Dominique LEBORGNE is a book with a difference. With superb photographs and informative text, its real delight is the integrated folders containing pull out facsimiles of historic documents. Talking about the fine weather earlier, it was interesting to pull out an extract from a booklet relating to the Great Flood of 1910. It includes a photo of flood waters reaching up to the arch of the Pont Alexandre III. Another facsimile is of a board game relating to Paris monuments from around 1820. Yes, it's time to revisit! With the recent présidentielles having been much in the news and the country coming to terms with differing hopes and expectations, it was good to see a chapter on The Builder Presidents, who left their legacies. A story book then with a difference, and while not the real thing, perhaps the next best to being there.